Casa de Retiro CHALET was the venue for a Workshop for Leaders from 18th till 20th of August 2017. 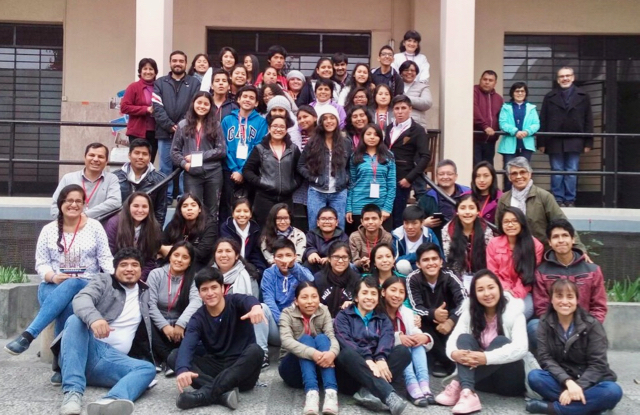 Among the participants were 45 young people from our missions in Lima, Bambamarca, Jaén y Trujillo, as well as two young persons who are searching for their vocation, and two former students of Lima and Jaén. The meeting was run by the Provincial Youth Ministry group composed of three collaborators and some RSCJ. The workshop enabled the young people to express their creativity and enthusiasm. It helped them to create friendship bonds across various cultures, and generated in each one present a spirit of mission and commitment to the common good. There were simultaneous group activities for the young people and those accompanying them, including education, reflection and relaxation. There was also one morning of ministry in the Peace Centre of the Brothers of Charity – Callao, where they welcome young males with different capabilities; and in the Queen of Peace Centre – Lima, that houses girls and young teenage mothers. In the afternoon we had a retreat to reflect on the experience. This helped the young people and those accompanying them to express proposals for organising our own Volunteer Programme. We ended with a sending Eucharist, blessing us with the missionary spirit of Philippine Duchesne. with our young people and for the building of the Kingdom.